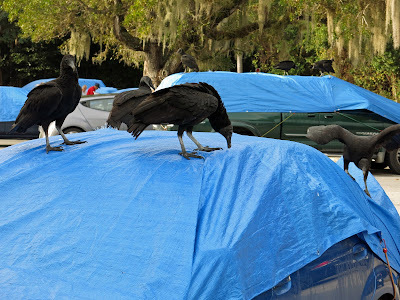 If it's vultures you're looking to avoid, than you may want to steer clear of the Anhinga Trail parking lot at Everglades National Park. How bad can it be, you wonder? So bad, the National Park Service has a large wooden chest filled with blue tarps and bungee cords for you to cover your car with, else the vultures bite, rip, and tear your windshield wipers and rubber trim off the cars, scratch up your paint, and, of course, make a giant mess all over your vehicle. The best part? Trying to put the tarps on your car while the vultures actively try to attack your windshield wipers. And then, hours later, trying to shoo the birds away so you can take the tarp back off.